Verve Records hosted a sparkling album launch event at the iconic Rainbow Room in New York City last Wednesday night that was highlighted by a stellar performance from Tony Bennett and Diana Krall of songs from their new collaborative album, LOVE IS HERE TO STAY, which was released recently worldwide on Verve Records/Columbia Records. The longest time between the release of an original recording and a re-recording of the same single (“Fascinating Rhythm”) by the same artist is 68 years 342 days, achieved by Tony Bennett (USA) in New York, New York, USA, on 3 August 2018. This marks Bennett’s third Guinness World Records title as he currently holds the titles for the Oldest person to reach No.1 on the US album chart with a newly recorded album for Tony Bennett and Lady Gaga: Cheek to Cheek and Longest time between UK top 20 albums. 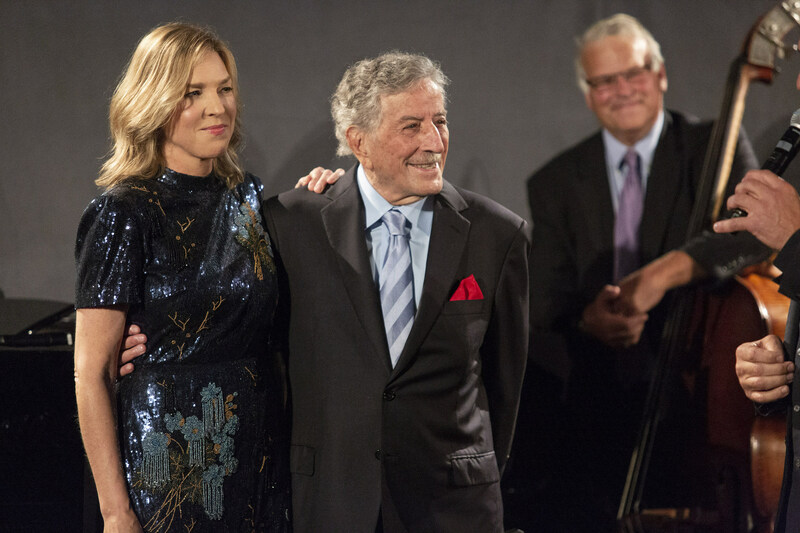 LOVE IS HERE TO STAY marks the first time that Diana Krall and Tony Bennett have recorded a full album together. The album was recorded with the Grammy award winning Bill Charlap Trio and the stunning result is a subtle, sophisticated and beautifully rendered love letter to The Gershwins’ music and their status as one of the premiere songwriters of the American popular standard. It is a masterclass in vocal delivery and phrasing and the command that Bennett and Krall display of the material in both their duets and solo tracks makes it appear effortless, belying the honed skill of the vocalists. The duet tracks include “Love Is Here to Stay”, “S’Wonderful,” “They Can’t Take That Away from Me” and “Fascinating Rhythm,” among them. Love Is Here To Stay is available on iTunes, Spotify and other outlets.